Ajax (also known as Aias) was one of the greatest of the Greek heroes who fought in the Trojan War*. He was the son of Telamon, the king of Salamis and a friend of Hercules*. Before the birth of Ajax, Hercules prayed to Zeus* and asked him to give Telamon a brave son. Ajax was named after an eagle (aietos) that Telamon had seen before his birth. According to Homer's epic the Iliad *, only Achilles* was a greater warrior than Ajax. Of great size and stature, Ajax supposedly looked like a tower when he went into battle holding his shield. He was courageous and good-hearted but spoke very slowly and preferred to let others talk while he fought. Ajax competed with other Greek warriors to win the hand in marriage of Helen*, one of the most beautiful women of the time. Helen finally married Menelaus, the king of Sparta. Yet Ajax and the other former suitors promised to help defend the marriage. The Trojan War. While Menelaus was away from home, Prince Paris of Troy persuaded Helen to accompany him to Troy. The Greeks vowed to rescue her, and Ajax contributed 12 ships and many men to the Greek army sent to battle the Trojans. threw his lance at Ajax, but it struck the belts that held Ajax's shield and sword and bounced off harmlessly. Ajax then picked up a huge stone that no other warrior could lift and hurled it at Hector, striking him in the neck and knocking him to the ground. After the battle, the two heroes exchanged gifts to show their respect for each other. Hector gave Ajax a sword, and Ajax presented Hector with a purple sword belt. When the Trojans attacked the Greek ships, Ajax led the defense by using a huge pole to fight off the enemy. His enormous size made him a target for many Trojan lances and arrows. Ajax was unable to save the fleet by himself, but the Trojan attack was turned back by the timely arrival of additional Greek troops led by Achilles' close friend Patroclus. Hector killed Patroclus and took his armor. Ajax covered the naked corpse with his shield. At the funeral games held in honor of Patroclus, Ajax competed in a number of events, including a wrestling contest with Odysseus that ended in a tie. The Death of Ajax. Achilles was killed by Paris, and Ajax brought the great champion's body back to the Greek camp and rescued his armor while Odysseus* fought off the Trojans. The armor led to a dispute between Ajax and Odysseus. Both heroes felt entitled to it. To settle the matter, the Greeks decided to take a vote, and they awarded the armor to Odysseus. Enraged by this decision, Ajax planned an assault on the Greek troops that night. However, Athena, the goddess of wisdom, drove Ajax temporarily insane, and he attacked a flock of sheep instead. After recovering his senses, he was so ashamed that he killed himself with the sword Hector had given him. After the Greek victory over the Trojans, Ajax the Lesser dragged Cassandra, the daughter of King Priam of Troy, away from the temple of the goddess Athena and assaulted her. As punishment, Athena caused Ajax and his fleet to be shipwrecked on their voyage home from the war. The sea god Poseidon rescued him, but then when Ajax boasted that he had escaped death against the will of the gods, Poseidon became angry and drowned him. According to tradition, a hyacinth flower grew where Ajax's blood fell on the ground. On its petals could be traced the letters AI —the first letters of his Greek name and a word in Greek that means "alas." A statue and temple were built in Salamis to honor Ajax, and a festival called the Aianteia was celebrated in his honor each year. 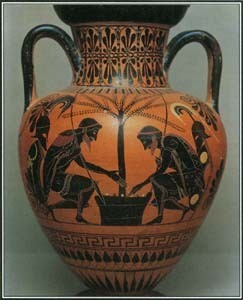 According to later Greek mythology, after his death, Ajax went to the island of Leuce with his close friend Achilles. See also Achilles ; Hector ; Helen of Troy ; Hercules ; Homer ; Iliad, the ; Menelaus ; Odysseus ; Paris .